Boyle spent all of 2018 on the Packers' roster but did not suit up for a game. Analysis: An impressive preseason earned Boyle, an undrafted free agent, a spot on the Packers' 53-man roster, but he was never activated for a regular-season game with fellow quarterbacks Aaron Rodgers and DeShone Kizer suiting up for all 16 contests. Kizer did not show a lot in the two games he saw extended action in, so Boyle could give him a run for his money in 2019. Boyle, an impressive surprise throughout the preseason, is expected to make the 53-man roster, Michael Cohen of The Athletic Wisconsin reports. Analysis: The Packers offered Boyle a vote of confidence following the decision to ship Brett Hundley off to Seattle. Boyle's impressive preseason appears to have placed the league on notice with multiple reports surfacing suggesting that Boyle would be claimed off waivers should the Packers opt to waive the 23-year-old. With a surge of added value over the past month, Green Bay reportedly feels inclined to keep Boyle around for the time being. Boyle is expected to get more snaps for Thursday's preseason finale against the Chiefs, Tom Silverstein of the Milwaukee Journal Sentinel reports. Analysis: With the Packers electing to have DeShone Kizer close out last week's loss to the Raiders, Boyle did not get a chance to play. Boyle is still not expected to make the team's final roster, but he should have plenty of chances to prove his worth Thursday. Boyle completed four of seven passes for 37 yards in Thursday's preseason game against the Steelers. 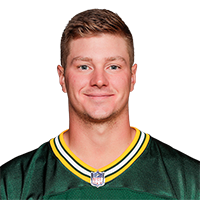 Analysis: Boyle did not get the chance to throw as much as he did in the first exhibition contest when he put the ball in the air 15 times, as the Packers were already well ahead when he entered the game. He certainly didn't hurt his chances of making the cut by any means, but he remains a long shot to do so. Boyle completed seven of 15 passes for 130 yards and two touchdowns in Thursday's preseason opener. Analysis: Boyle's accuracy was not on point Thursday, but the bulk of the seven passes he completed were rather impressive, including perfect tosses on each of his scores. Boyle faces long odds to make the Packers' Week 1 roster given the experience of fellow reserve quarterbacks Brett Hundley and DeShone Kizer, but if he keeps playing like he did Thursday, there is a good chance a spot on the Packers' practice squad is reserved for him. There are no videos available for Tim Boyle. Click here to view all videos.